The first season of Stranger Things came as a total surprise. Although that wasn’t the only great thing about it, the unexpectedness did make all of its other appealing qualities — the ‘80s-soaked production values, its excellent cast of young newcomers, the unbearable tragedy of Barb — that much more pronounced. It was great television, and the fact that it felt so under the radar — for a week or two, at least — made it even greater. The second season of Stranger Things, created by the no-longer-unknown Matt and Ross Duffer, obviously doesn’t have the same out-of-nowhere quality working in its favor. Given the omnipresence of the Stranger Things kids, the internet’s fixation on spoilers, the trailers that sparked internet freak-outs, the existence of Stranger Things–inspired bars, and the fact that it’s impossible to enter a Halloween store right now without being encouraged to dress up as Eleven, there’s no way to avoid knowing that Stranger Things 2 arrives on Netflix this Friday. With this much monstrous hype surrounding America’s favorite Demogorgon drama, is it even possible for it to live up to expectations? It’s my pleasure to inform you that the answer is yes, it does live up to expectations. It might even exceed them. Though it takes two or three episodes for the various story lines to fully kick into gear, Stranger Things 2 is a suspenseful, thoroughly satisfying follow-up that goes to emotionally deeper places than its predecessor did. In a way, it’s even a surprise of sorts: When a second season was announced all the way back in August 2016, I’m not sure that anyone expected it to be this good. Stranger Things 2 works with many of the same basic materials as the first season. Set in October 1984, roughly a year after the events of season one, the series once again forces its preteen protagonists to work together to combat an insidious force of evil. Like its predecessor, it overtly pays homage to the popular movies of the era including, E.T., Poltergeist, Aliens, and a Nightmare on Elm Street, but also Ghostbusters, the John Hughes teen movies, and, perhaps most explicitly, Gremlins and The Goonies. The central cast members are back and doing even more affecting work than they did the first time around. The production design and the music — Kyle Dixon and Michael Stein are again responsible for the score — continue to evoke the period in ways that make the show a glorious blast of nostalgia, but without preventing it from standing as a compelling work of contemporary sci-fi–horror in its own right. Meanwhile, the scope of the storytelling broadens and becomes more ambitious, which reflects both a heftier budget — according to Variety, each episode of season two cost around $8 million to make, an increase over season one’s $6 million per episode — and the sequel-making impulse to go bigger during round two. In that spirit, the first episode opens with an action sequence that announces Stranger Things will go to places far beyond what we saw in the first season. That introduction is also so out of character with what came before it and nearly all of what comes afterward, I thought I had inadvertently clicked on the wrong Netflix show. Are Eleven and the Demogorgon Connected? Watch this convincing fan theory and decide for yourself. And then there’s Will, who is grappling with increasingly debilitating PTSD brought on by the approaching anniversary of his disappearance into the murky parallel universe known as the Upside Down. Because his character vanished so early in season one, Schnapp didn’t get a whole lot of screen time in the initial run of Stranger Things episodes. He more than makes up for that absence with a believable, gut-wrenching performance here. All of the actors are great, but Schnapp is, without a doubt, season two’s MVP. Will’s struggle is one of the things that makes Stranger Things 2 much more than just a fun retro riff. The events of season one aren’t just shaken off in favor of rebooting the show with another invented threat. Instead, season two confronts the notion of lasting trauma and how it impacts Will, his mom Joyce (Winona Ryder), and the older teens Nancy (Natalia Dyer), Steve (Joe Keery, still sporting his signature fabulous hair), and Will’s brother Jonathan (Charlie Heaton), who are affected both directly and indirectly by the loss of dear, bespectacled Barb. (She is gone, but she is by no means forgotten.) A sense of melancholy runs through the whole season, grounding all the sci-fi business about monsters and the Upside Down — which, admittedly, is explained in somewhat convoluted fashion — in something solid and often genuinely moving. Like most second seasons, Stranger Things benefits from the fact that we immediately feel invested in the lives of the characters. Considering that there were only eight episodes in the first season — this one stretches the number to nine — it’s pretty amazing how deeply our affections for these people run. I’m not going to say the first time we see Jim Hopper (David Barbour) is the equivalent of that scene in The Force Awakens when Han Solo reemerges, but there is certainly a similar thrill that comes from reacquainting ourselves with the rugged police chief after a year-plus absence. At the same time, the new characters who are introduced — including Max; Dr. Owens, a new doctor at the shadowy Hawkins lab who’s played by Paul Reiser; and Bob Newby, Joyce’s sweet and ultradorky boyfriend, portrayed by former Goonie Sean Astin — slide seamlessly into the ensemble as if they’ve been there the whole time. As far as flaws go, there is one episode in the second half of Stranger Things 2 that, like the season’s opening sequence, is so tonally different from everything else that it briefly knocks the whole enterprise off-balance. It also hits pause on the rest of the plot at the exact moment when most people will want to binge the rest of the season immediately. It’s the most noticeable misstep in what is otherwise a very confident, expertly paced season. It’s worth noting that while the Duffer brothers directed six out of the eight episodes in season one, they direct fewer than half of them in season two. Instead, they hand over the reigns twice to producer Shawn Levy (who also directed two episodes last year), twice to Pixar veteran Andrew Stanton, and once to Rebecca Thomas. But all of the filmmakers and writers have an innate understanding of the mix of familiarity and discovery that audiences crave from this type of material. They whip up plenty of Spielbergian imagery — like flashlight beams slicing through the night air and shots of horrified faces staring at something off-camera that the audience has yet to see — but the directors also evoke that sense of giddy dread that works its magic only when we’re not sure exactly what’s about to happen yet. 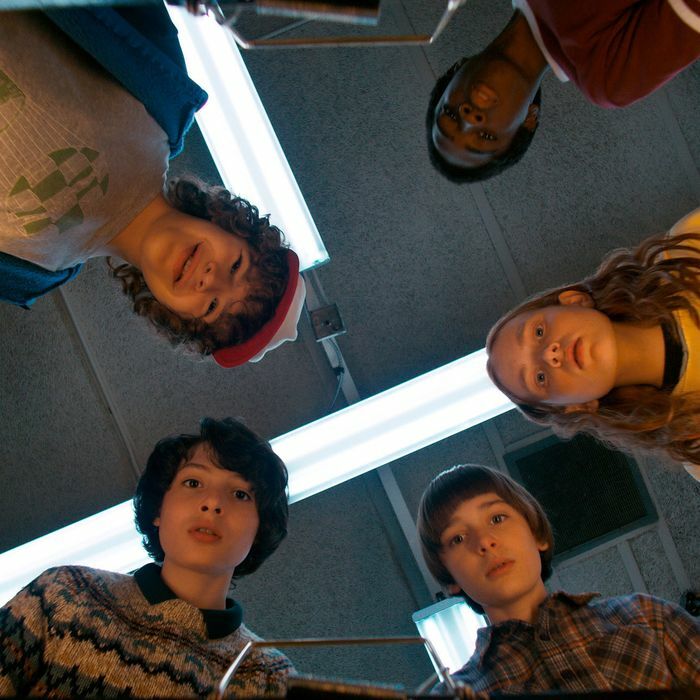 Cleverly, Stranger Things 2 refers back to season one almost as often as it tips its hat to the pop culture of the ’80s. Some might say that’s just another example of the show’s habit of recycling overly familiar material and trying to pass it off as something new. (In one meta moment that addresses critics, Max dismisses the whole cockamamie tale about Eleven and the Upside Down as “a little derivative in parts.”) I say it’s a way to show continuity between seasons, while subtly acknowledging what Stranger Things has become: The best ’80s-blockbuster franchise that didn’t actually come out in the 1980s.